In order to set up your VOD site to use Segpay, this will take changes on Segpay's admin panel, and then setup within your VOD area. You will need a new Postback set up within their admin panel that links to your VOD area. Under Postbacks, you will want to add a new Postback. - Under Member Management Postbacks, you will need to keep all of the information here blank. We are only adding information under the "Trans Post" header. - Under Trans Post, you will want to put in. a. For the site URL, you will want to put in [SITENAME]/vod/postback.php for your url. As an example, if your VOD URL is "https://classic.elevatedx.com/vod/", you will want to put in "classic.elevatedx.com/vod/postback.php" for your postback URL. b. Make sure to check "Use SSL" if your postback URL starts with https instead of http. - Under Expected Response, make sure to put in "Success" (without quotes) as the value here. After this, you can scroll down to the bottom of the page and save this entry. 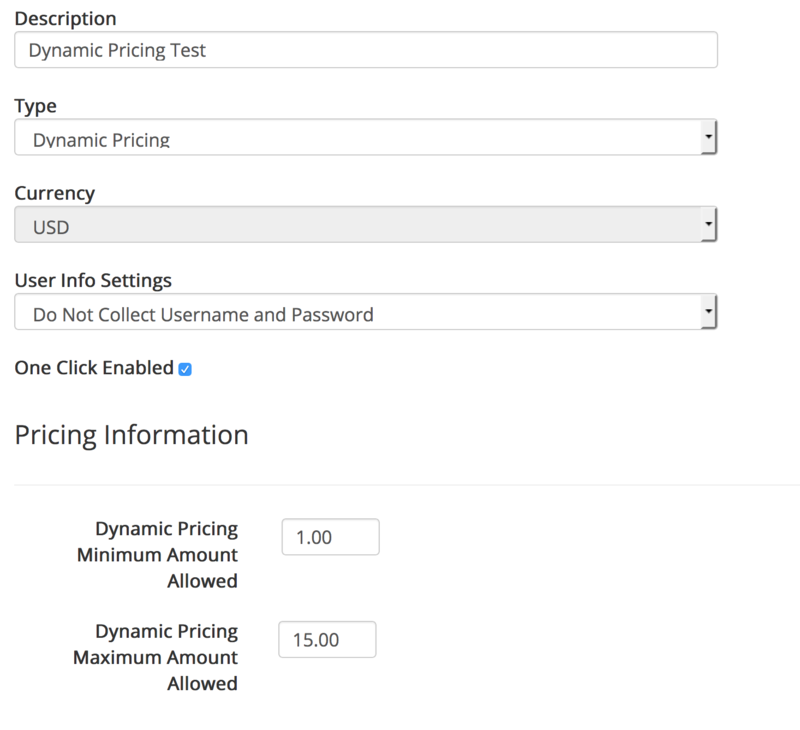 2) Once this is done, you will need to set up a price point that using dynamic pricing. This is under "My Websites" => Price Points. - Under Type, make sure this is of type "Dynamic Pricing"
- Under Currency, set USD. - Under User Info Settings, make sure that "Do not collect username and password" is set. - If you want to do One Click Upgrades, make sure this is checked. - Under pricing information, make sure the minimum / maximum value you want is set here. When you have created this entry, be sure to save it. Take note of the Price Point Id that was created. 3) Now, you will need to create a new package under "My Websites" => "Manage Packages"
You will need to make sure. - Postback is set to use the Transaction Postback you set up earlier. - Under Pricing, that the Dynamic Pricing Package that you set up is checked. Once this is saved, please take note of the Package Id that was created. 1) Within the VOD menu at the top of your CMS Admin Panel, choose the Billing dropdown. 2) Add a new Billing Entry. 3) Under Biller Type, make sure you choose Segpay from the available options. 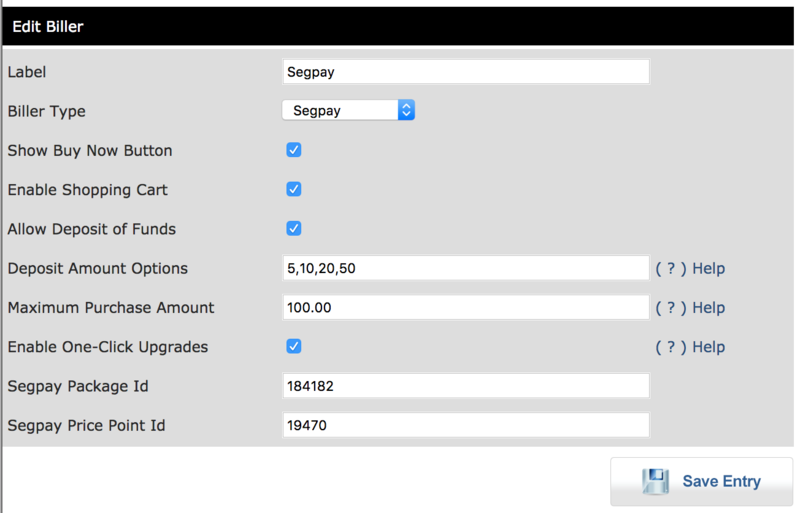 5) Under Segpay Package Id, enter the value that of the Package Id you noted from above in Step 3 of Segpay Admin Setup. 6) Under Segpay Price Point Id, enter the value of the Price Point Id you noted from above in Step 2 of Segpay Admin Setup. 7) If you have enabled one-click upgrades for your price point, you will want to make sure this is clicked in the admin panel here as well. 8) Click Save Entry. Your Segpay processor is now set up.